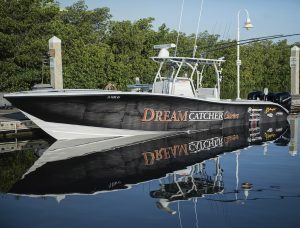 Our Reef fishing chariot, our brand new custom built Yellowfin 36 Center Console. Powered by Triple 350 Mercury Verados and loaded with Garmin Marine electronics. Just 5.6 miles South of Key West is located the only living coral reef in the Northern Hemisphere. We call it ” The Reef” but truly its more. 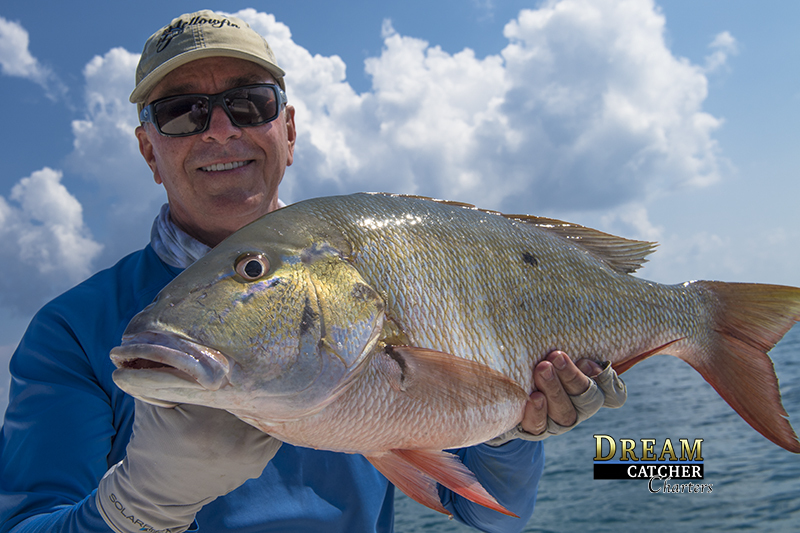 The clear caribbean waters of our reef line hold some of the best fishing that can be had in the free world. Just a 15 minute boat ride and you are enjoying some of the tastiest gifts from our ocean here such as Yellowtail Snapper, Mutton Snapper, Red Grouper, Black Grouper and Mangrove Snappers. For sport and fight the reef off of Key West also has some huge great barracudas, three types of mackerel with a mix of sailfish and tuna all depending on the time of the year and the Key West fishing season. 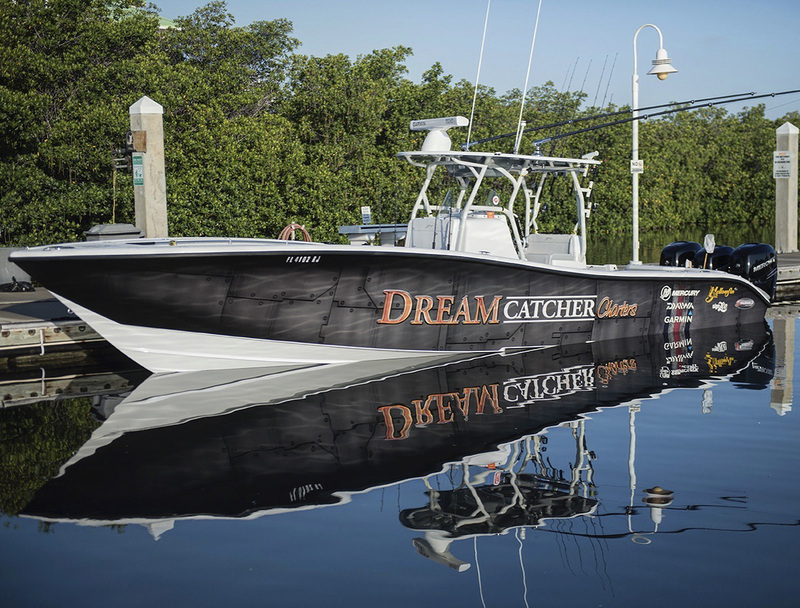 Come with us here at Dream Catcher Charters to fish the reef on board our brand new state of the art custom built Yellowfin Yachts 36 Ft triple engine center console reef fishing boat. We use this boat for reef, wreck and deep sea fishing and it does all the above very well. The Too Intense is a 2017 36ft Yellowfin Deep Vee center console.. Arguably one of the nicest fishing platforms being made today for this type of fishing. She has a bathroom, plenty of cooler space provided from two large Yeti coolers. Loads of storage to keep your stuff dry and safe. Seating for everyone and bean bag chairs provided on request. Two overly large bait wells cary more bait than we will ever need. Our electronics are top of the line from Garmin marine with chart plotting and sounding technology rivaled by no one in the industry for charter. Powered by Triple 350 Horse power Mercury Verado outboard motors our Yellowfin 36 has a 40+ mph cruising speed that gets you to the fishing grounds faster and safer than any other boat in the Key West charter fleet. Add all that to our beautiful compliment of DAIWA fishing gear and you have yourself a battlewagon for fishing that is second to none. We offer light tackle fishing out to the different more productive parts of the reef fishing for all that is there and legal to keep for you dinner or to take home after you captain cleans the fish for you at no extra charge. 4, 6 and 8 hour charters are available for up to 6 persons. Please check out our Key West Reef fishing rates page to learn more about the costs of such a trip. This fishing charter will focus on the reef directly. Catching as many tasty yellowtail snappers as possible. A quick run in our 36 Yellowfin gives you at least 3 solid hours of fishing several different spots. We drift allot and cast allot making the experience more fun for our anglers and yielding larger fish over all. The occasional mutton snapper and grouper along with a good shot at some fast fighting fish like mackerel, barracudas and yellow jacks. January – April we focus on yellowtails, mutton snappers and mackerel with a side of sailfish. Get a little further down the reef from all the traffic of Key West and fish for numerous tasty yellowtail snapper, mutton snappers and mangrove snappers. Casting and catching is the way we do this trip as well. If in season to diversify the box a little we might even deep drop in the summer for a blue line tile fish, snowey grouper or hit a wreck for an amberjack or a deep reef for yellow eyed snappers. Along the way always taking shots at yellow jacks, mackerel and barracudas. January – April subtract grouper and add kingfish and sailfish possibilities. 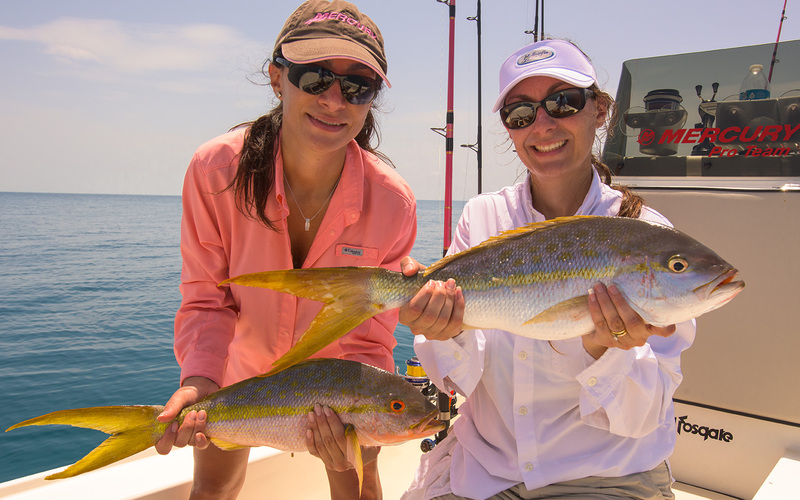 Yellowtail snapper sisters fishing with me on the reefs of Key West. Lots of fishing for lots of different types of fish. Fish all day for all the snappers and groupers (if in season) out where most of the other boats don’t go. Work the outer reef, deep reef and the inside patch reefs with our style of catching and moving. Always on the move you won’t get bored on this reef fishing charter. The 8 hour Workout can also include the Full Day Offshore All In Wonder Charter.